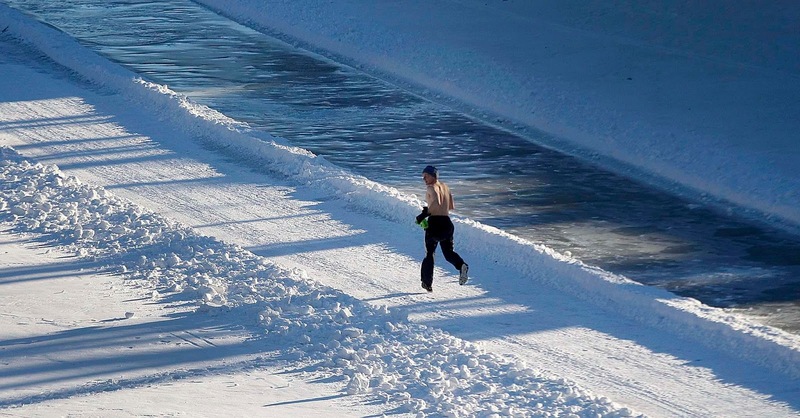 I went for a run on Winnipeg's frozen Assiniboine River the other afternoon, which has been plowed to make a nice long skating and running/walking path. It was a beautiful day, around 0C / 32F and sunny, so I started to get pretty warm. I took my toque and gloves off, but I was still sweating. Rather than be forced to take a shower when I got back to work... I decided to take my shirt off! Believe it or not, I was not cold at all. I expected to need my shirt again after a while, but I was super comfortable for the whole rest of my run. Running in -25C for the last month or two must have prepared me!